Support Mark Dane this Christmas and make a donation. 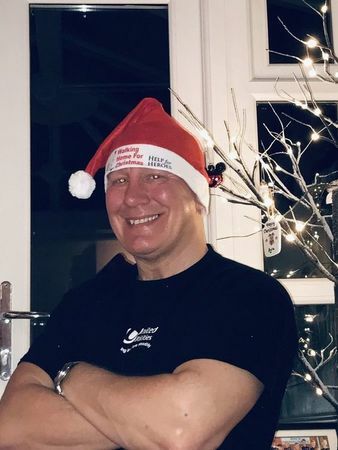 Dave young man, Thank you so much for your kind and thoughtful donation I completed the walk in 7hrs and 10mins my feet were like hot coals after the event very rewarding to know its now completed 23 miles so I can enjoy the Xmas period thank you. Thank you Nikki for your kind and thoughtful donation I completed the walk in 7hrs and 10mins my feet were like hot coals after the event very rewarding to know its now completed and I can enjoy the Xmas period with my mince pies. Sam, Thank you so much for your kind and thoughtful donation I completed the walk in 7hrs and 10mins and had very hot feet after the event, but very rewarding to know its now completed 23 miles phew! Best wishes mate. Don't drink too much in the Viking's Landing, it's a long way to Copper Pot. Cheers Dave, Thank you so much for your kind and thoughtful donation my prize is at the end of the walk mate otherwise I will be stopping every 10 mins if I hit the Viking's Landing & The Copper Pot, but I will have a pint to celebrate at the end. Good Morning Beryl, thank you very much for your kind donation we aim to complete the walk early next week so I will let you know how we get on.